I'm stumped by MySpace too! Because I don't "get" it. I mean, I know what MySpace is and what it's supposed to do and how influential it is. It's just that whenever I've visited a MySpace page I've thought "is that it?" and wandered around the perimeter looking confused, like a blind man patting the walls for an exit he can't find. Ze Frank on Bill's Gates' charity plans. Unofficial plans include giving out booster shots that need to be updated every year for a premium, and the release of a vaccine that will make the patient more vulnerable to other viruses that Gates is also working on the vaccine for. Both vaccines are schedule to be released in the year 2481. By the way, was that Fox Mulder? Now, THIS GUY I'd consider voting for. Okay, here's something fun and non-political featuring Boston boy Ben Affleck. I saw this stuff on a TV commercial recently. I said that maybe I should get some. My teenage niece looked at me, kinda sad, shaking her head, as if to say, "I don't think so, Uncle Jack." David "Big Popi" Ortiz hit a two-strike, two-out, walk-off homerun to beat the Texas Rangers today. Oh, and the Yankees lost, again. Boston is 1.5 games ahead of NY in the AL East now. Boing Boing writes about how it's possible for regular citizens to initiate the process of impeaching the President. There's a little known and rarely used clause of the in the rules for the House of Representatives which sets forth the various ways in which a president can be impeached. Only the House Judiciary Committee puts together the Articles of Impeachment, but before that happens, someone has to initiate the process. In 1984 Peter Feldstein took pics of the people of Oxford Iowa. Last year he returned to take updated pics of those same folks. Twelve is a magical number. It's divisible by two, three, four and six. There are twelve months in a year, twelve hours on a clock, twelve signs of the zodiac, twelve tones in the musical scale, and twelve in a dozen, twelve inches in a foot, twelve Knights of the Round Table, twelve members in a jury (usually), twelve labors of Hercules... twelve must have something going for it. We use the decimal system because there are ten fingers on our hands. But we might as well have used a duodecimal system: there are twelve phalanges on our four fingers (thumb used as an indicator). In fact, some cultures do use duodecimal systems. One can find a Dozenal Society that advocates use of duodecimal system in the US and in other countries. ADDENDUM: One thing I like about this idea is that, in base-12, I'm 48 years old. Eaten in the Salem Diner, and the Bel Aire. I think I've eaten in the Agawam (it looks familiar). I remember one in NJ but I don't remember the name. And the one in Malden isn't listed. The Bel Aire in Peabody is currently closed for renovations. The Agawam up on Rt 1 in Rowley is a classic. I first ate there one summer when I was a kid, when my Dad would take me with him up to a job site on Plum Island. He recently told me that the Agawam used to be located in downtown Everett Mass, and was moved, many years ago, to the present location. The coffee you drink as a pick-me-up in the morning could also make you more open to persuasion, researchers say. Evidence from a new study suggests that this happens because caffeine revs up the brain, not because it generally boosts mood. (*) You have to be a regular reader of Etcetera's comments to even begin to understand this inside joke. In my ongoing quest to find the best Diners in my world, I had repeatedly heard about Kelly's in Somerville (not to be confused with the excellent seafood/roastbeef place in Revere). Kelly's is just up the street from where I used to live in Somerville, so it always struck me as odd that I'd never tried it back then. And these days, it just wasn't near my beaten path. But this morning, my location and my urges converged, and I found my way to this classic diner in Ball Square, Somerville. It totally lived up to its reputation. It's a renovated O'Mahoney diner-car diner. 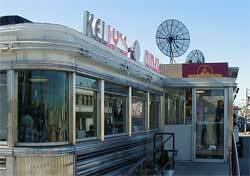 These are the legendary prefab diners, originally built in the mid 20th century. The mystery of why I'd never eaten here, when I lived in the neighborhood back in the late 80s, was solved when I discovered that this Diner was moved here in 1996. It had spent the previous 4 decades in Delaware. The food was great. My omelet was big, yet fluffy. It arrived hot. It was neither over- nor under-cooked. The coffee was served in genuine, heavy ceramic, diner mugs, not these distressing little thimble-like things you find most places. The service staff was friendly, prompt with the refills, and while I ate at the the counter I listened to them pleasantly grumbling about lost checks and the malfunctioning soft-drink machine. The menu lists a turkey club sandwich. I'll have to stray into this neighborhood again some time soon. "No one knows we are here"
...some network television correspondents had reached the unsettling conclusion that, even as they were risking their lives in the war zone, audiences and producers in America had grown weary of much of the coverage from Iraq. ABC correspondent John Berman in Baghdad wrote in his blog recently that he and his colleagues felt like the castaways on the network's prime-time drama "Lost" — "We have come to the conclusion that no one knows we are here." Earlier, he wrote: "There is definitely a sense that the public feels like it knows what is going on here, and doesn't want to hear anymore about it." 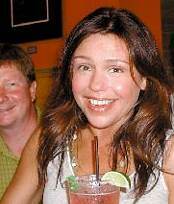 Food Network headliner Rachael Ray was in Portsmouth Thursday, tasting some of the local cuisine and dining atmosphere of some local restaurants for an upcoming edition of "Rachel Ray’s Tasty Travels." Due to a looming problem with the DNS for my domain da4.com, email & webpages at that address may have some problems over the next couple of days. UPDATE: The danger seems to have passed with no downtime. Paddling about a week ago we came across this very impressive rock tower sculpture. It was about 18 inches wide, and a few feet high above the water. It was built in about 9 inches on water.